If you have been collecting Turquoise Jewelry or especially if you are beginning to collect Turquoise Jewelry it is always nice to get a good deal on a new piece, that is why we are all looking for Bargain Turquoise Jewelry. It is easy to find imitation jewelry for a bargain, but it is hard to find real Southwestern and Native American Jewelry at a bargain price. You can browse the Internet and find a million fake Turquoise Jewelry pieces for stupidly cheap prices. Most of this jewelry is made with imitating stones, cheap metal and questionable craftsmanship. Most of the quality Turquoise jewelry is very valuable and hard to find. We have a solution for Bargain Turquoise Jewelry! 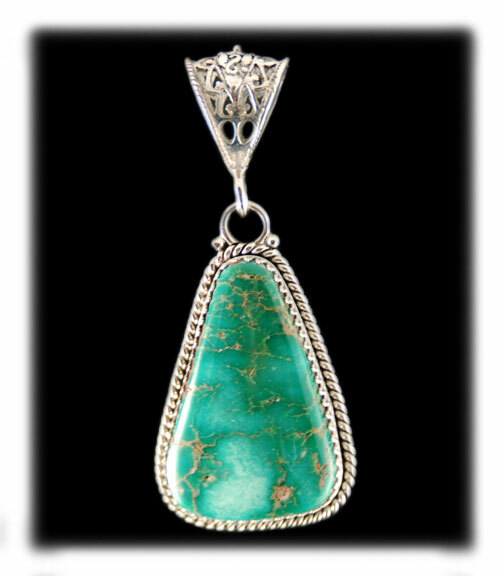 Durango Silver Company has been in the Turquoise and jewelry business for many decades. We own Turquoise mines, cut our own Turquoise, make our own jewelry and we also buy old collections. With our experience we know what is good and what is not. We know values of stones, metals and jewelry better than most. We are probably the best pickers you could find and we have been buying for decades. We have giant inventory that passes through our business from time to time. Through out the years we have seen it all good, bad and ugly. 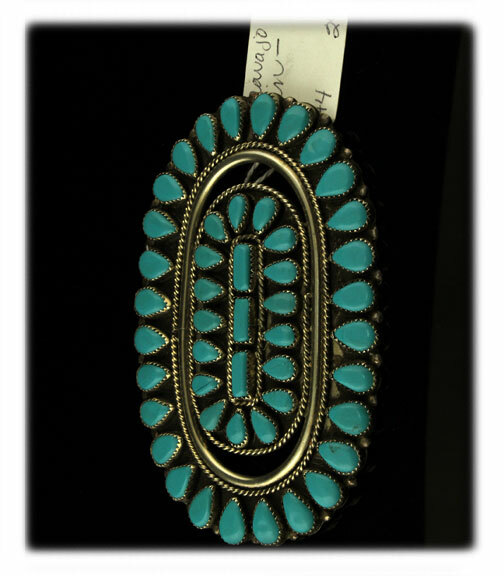 We buy entire collections and then we grade the vintage Turquoise jewelry that we have purchased. Some of this vintage Native American Jewelry is of museum quality, some is of above average quality, some is of average quality and some is low quality. We have begun to sell our selection of average quality and low quality silver jewelry in our "Bargain Barn", the place to find good Bargain Turquoise Jewelry with authentic gemstones, real Sterling Silver and quality craftsmanship. Browse our selection of artisan handmade jewelry which is on sale. Some of the jewelry in this category is as much as 50% off MSRP!!! You will find deals here on REAL Sterling Silver and Gemstone Silver Jewelry that you cannot find anywhere else. All of this jewelry is genuine with real gemstones and has been artisan handmade. Some of these items are vintage Turquoise jewelry items we have bought in collection for smoking deals and we are passing on the deal to you. Some of the sale jewelry is merchandise we made and received smoking deals on the materials we used to make the jewelry, through our vast connections, knowledge and deal finding know how. Take a look, you might find more than one item to buy! Pawn Indian Jewelry has been collected by many for years and Old Pawn Turquoise is now considered Vintage Native American Jewelry. Native American Indians wait for the pawn to be released monthly to find inexpensive Turquoise Jewelry for themselves and collectors hunt for Old Pawn Turquoise for their collection as well as to resale. Pawn Indian Jewelry has been a way of life since the 1800’s and the beginning of the Indian Traders and Trading Posts. Today many people collect Vintage Native American Jewelry and hunting Pawn Indian Jewelry at the Indian Trading Posts and Pawn Shops is a great way to find good Antique Indian Jewelry. Above are two examples of Bargain Turquoise Jewelry we offer on our website. To the left is a vintage Arizona Turquoise and silver cluster pin. 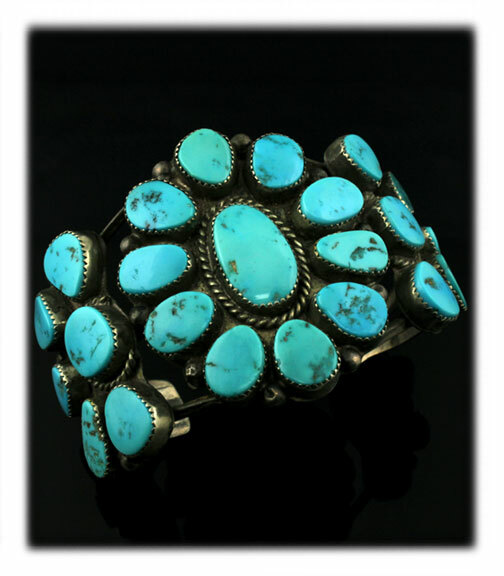 This piece of Pawn Turquoise Jewelry was made in the 1950s. 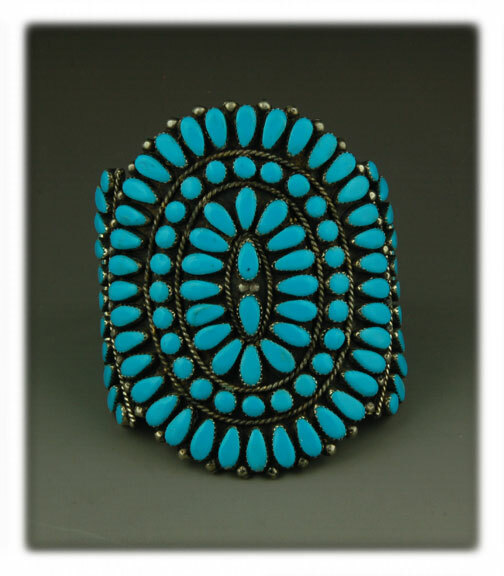 This Navajo handmade American Turquoise and silver broach was worn as a ceremonial piece. This piece of Bargain Turquoise Jewelry is offered at a deep discount as it was part of a huge trading post buy out where we bought hundreds of pieces of vintage Turquoise jewelry at vintage prices! Above to the right is a high quality pair of Sterling Silver and blue Turquoise earrings by Nattarika Hartman. This is a gem quality pair of Turquoise Bead earrings that we have decided to make a bargain. The discount is not as deep, but the quality is higher and so was our cost in the materials to make the earrings. 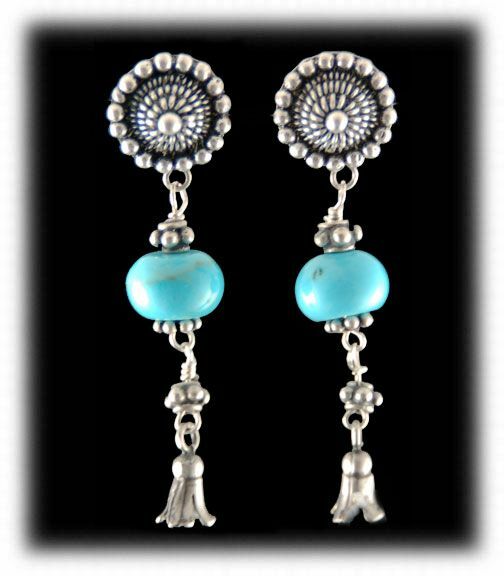 Above are more examples of Bargain Turquoise Jewelry from Durango Silver Company. To the left is a beautiful natural Italian Coral and Turquoise bead necklace. 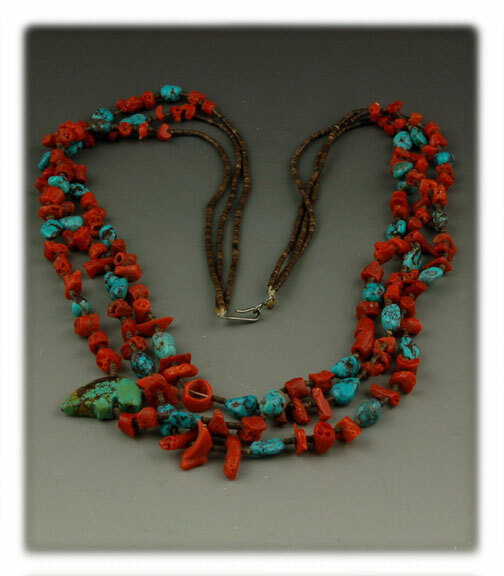 This piece of genuine Santa Domingo jewelry features real Kingman Turquoise beads and genuine red Mediterranean coral. Look at the beautiful Turquoise fetish bead. This is really a quality piece. Above to the right is an amazing vintage Navajo Cluster bracelet with genuine Sleeping Beauty Turquoise from Globe, Arizona USA. This bracelet is killer. Normally we would feature this bracelet in our Vintage Jewelry section, but we purchased it for such a good deal we though we would pass the deal along. Fine pieces like this rarely go on sale. Above to the left is an example of Green Turquoise Jewelry that is in our bargain barn. This is a piece of handmade Sterling Silver jewelry with natural Broken Arrow Turquoise from Nevada. Above to the right is fine cluster of bright blue Sleeping Beauty Turquoise from Globe, Arizona on a large Navajo made bracelet. This is another example of a rare Bargain Turquoise Jewelry find. Look at the color of that Turquoise, look at all the craftsmanship and time that went into this piece. This fine bracelet came from the Shanto Trading Post. Make sure checkout our Bargain Barn and all it's New and Old Pawn Indian Jewelry. We have a ton of vintage Turquoise jewelry and we will be adding it to our selection of Bargain Turquoise Jewelry steadily. We will continue to buy large collections so keep you eyes peeled. We buy Old and Dead Pawn from the Indian Trading Posts throughout the Four Corners Region and will offer the bargains we get direct to our customers at a fraction over our cost. We are hunting for valuable old Indian Pawn Jewelry that is expensive, rare and valuable and we will not be offering that in the Bargain Barn. However, in hunting for that quality of jewelry we will run across a lot of medium level and productuion jewelry that will allow us to get the valuable pieces by buying the entire lots. We may get one great, valuable piece by buying 25 other pieces as a lot or collection. This is just how treasure hunting works. That is great news for those of you look for Bargain Turquoise Jewelry. Old Pawn Indian Turquoise Jewelry has been a way of life in the Southwest from many years and it will continue for many more to come. Native Americans, as well as other people, will continue to pawn their old Turquoise Jewelry and some of it will become Old Pawn Turquoise Jewelry when they let it go dead. If you are a collector of vintage Native American Jewelry, you could consider hunting for it at the Indian Trading Posts and Pawn Shops in the Southwest. We have writen a couple of great stories you might find interesting. The purchase of the Fort Defiance Trading Post and the Chilchimbito Story, check them out! If you are interested in Pawn Indian Jewelry or Vintage Native American Jewelry you should join our Newsletter. We put out a monthly email letter on Turquoise Jewelry, Durango Silver Company and whats going on in the Southwest. We often include great information on old Indian Jewelry and historic articles from the Southwest. You can join below. Thank you for reading about bargain Turquoise Jewelry.